Minecraft Modding: Mapping IBlockStates to IBakedModels. ISmartBlockModel. Mapping IBlockStates to IBakedModels. ISmartBlockModel. The IBlockState is used to look up a ModelResourceLocation using BlockStateMapper. The ModelResourceLocation is then used to retrieve the IBakedModel using ModelManager. After retrieving the IBakedModel, Forge checks if this is an ISmartBlockModel. If so, it is customized using IExtendedBlockState information for the specific Block position being rendered. In this example, it will create an IBakedModel from granite_model.json. 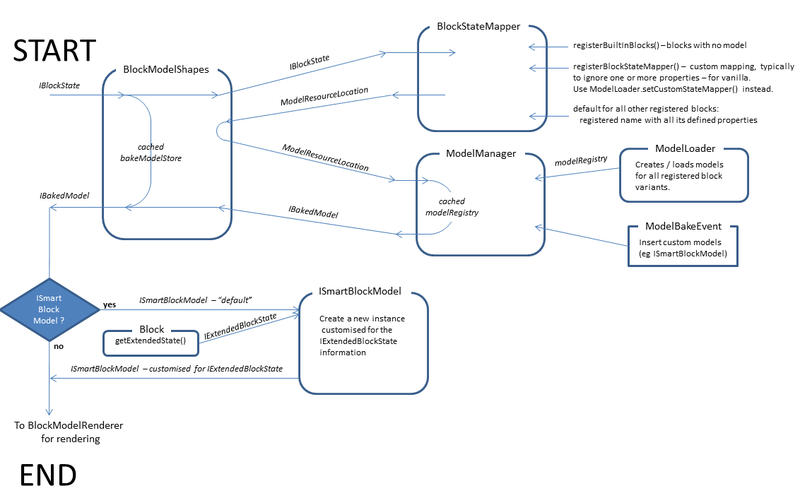 It’s usually not necessary to provide an appropriate BlockStateMapping, because the default uses your block’s registered name and its properties, which are generally what you need. If you do need a custom mapper, use ModelLoader.setCustomStatemapper(). BlockModel.registerAllBlocks() has good examples how to ignore some of a block’s properties, for example cactus model is the same for all AGE values. By default, ModelLoader registers a ModelResourceLocation for every entry in the BlockStateMapper. You can use ModelBakeEvent to insert custom models into the ModelManager; alternatively you can register an ICustomerModelLoader with ModelLoaderRegistry, which bypasses the vanilla ModelLoader for your chosen blocks– for example see B3DLoader. The various registries are cached and only updated when the resources are reloaded. Hi! I tried to replicate your SmartModel 3D Web, but IBakedModel is deprecated... Will you update this in the near future? Or should I continue doing it that way? I am building Quantum API (https://j.mp/QuantumAPI), and I am about to release a public beta. The last step before actually releasing the beta version is to get Models working. Long story short, I'm trying to figure out the whole rendering structure. Your tutorial explains how to do things well, but not the whole structure. What I'm looking for specifically is where Models are loaded, assembled, and used. The way the API currently is, you have a choice of AbsoluteModels, which are normal models that are permanently scaled to the default 16x16 resource packs, and ReflexiveModels, which scales models according to the resolution of the resource pack, so, for example, if the resolution is 32x32, a ReflexiveModel is rendered at half the size. I need to know how to make a custom renderer for Blocks, Items, Entities, etc., the current system I already understand. I just can't seem to find which method in what class that I call to add custom resources to a resource pack. Check out ModelLoader. That's where all the action starts. It's pretty complicated. IModel is the interface for models loaded from model files, before they are baked. Source all of the new age. G club Online Casino Site Online Casino Games I can get into my own luck at home. Investors can gamble every day. Gambling can be played easily. There are many different types of gambling. Provides complete comfort. I like to play where you can enjoy the bet that the gambler will play on a daily basis. Exposure to all types of gambling. Only a gambler likes to gamble to get the full service at the online betting site, where you can play this thrilling.